In the past two weeks, we have witnessed how the devastating after-effects of a school shooting can reverberate long after the immediate trauma. In the past week, two survivors of the Parkland massacre of 2018 — a 19-year-old graduate named Sydney Aiello and an unnamed Parkland sophomore — both died in apparent suicides. And on March 25, Jeremy Richman, whose daughter Avielle was killed at Sandy Hook Elementary in 2012, was also found dead in an apparent suicide. 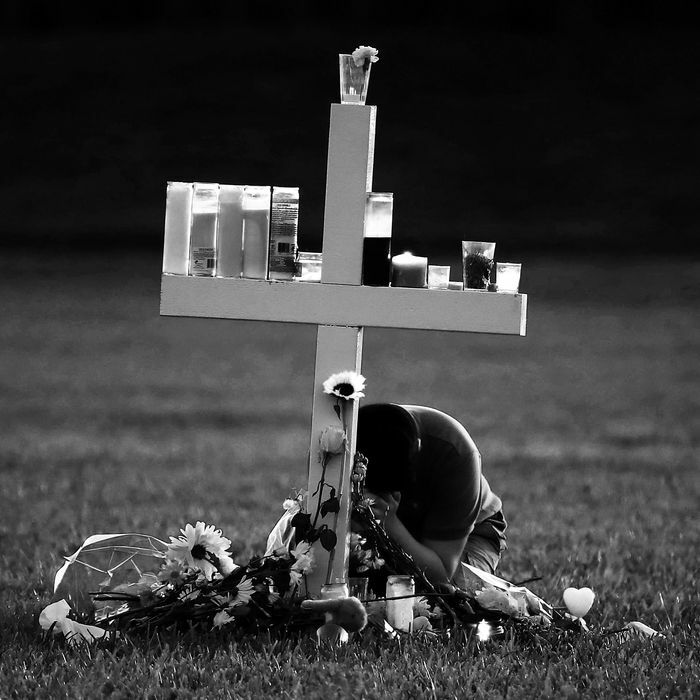 This is not the first time we’ve seen the toll that experiencing the trauma of a school shooting can take; after the Columbine massacre of 1999 one student and the mother of a student who was severely wounded took their own lives. And as the Daily Beast reported, six students attempted suicide after a 2012 shooting in Ohio that left three schoolmates dead. Aiello’s mom has said her daughter struggled with PTSD and suffered from “survivor’s guilt” after living through the deaths of her classmates. While school shootings have become an American epidemic, psychologists and experts in trauma are just beginning to gather data on how these events affect survivors and their communities in the long term. To find out what we do and don’t know about the mental-health effects of surviving a school shooting, we spoke to Amy Nitza, the director of the Institute for Disaster Mental Health at the State University of New York at New Paltz. Nitza’s work focuses on understanding the psychological implications of disasters such as school shootings. It’s been an awful week. What do you take away from it? It’s a reminder of the level of devastation these events create and how debilitating the mental-health consequences are on people. At Sandy Hook, it has been six and a half years after the incident and so many mental-health resources that have been poured into that community, and yet there’s this level of suffering. These suicides are likely to have a really strong impact on other survivors. I think we can expect there to be a ripple effect in terms of triggering a resurgence of other people’s pain. What do we know about the mental-health effects of school shootings?School shootings have opened up a whole new set of questions. There’s all these sorts of questions around how best to protect kids from exposure to more trauma in the aftermath, because any reexposure to the setting, sights, sounds, or smells of the incident have the potential to become real triggers. For example: what kind of memorials do you do, and how many? Do you keep teddy bears and gifts people have sent on display? And how soon do you reopen the school? What’s the best way to help kids collect their belongings? One of the parents of one of the women who died said that her daughter had been suffering from “survivor’s guilt,” which is a term that gets used colloquially. What do we know about that phenomenon from a psychological standpoint? Survivor’s guilt by itself is not a diagnosis. it’s a phenomenon that occurs. Typically it involves the triggering of belief or a question about one’s worth and one’s value, as in why did I survive when other people did not, or why did I deserve to live and others didn’t? It can trigger these sort of deep existential questions that there aren’t really answers to. And wrestling with these questions become a really significant challenge cognitively and emotionally that can build on itself and create cognitive distortions. What do you mean by cognitive distortion? It’s like a misattribution [of blame or agency to oneself], like, “if only I hadn’t stepped out into the hallway when I did I might have been able to save my friend in the classroom.” The survivors start to distort in their heads their behaviors and what they could or could not have done in that situation. There’s also a phenomenon around feeling like since they did survive there’s some deep sense of pressure to achieve something or to live up to that expectation. These distortions are linked to mood changes and depression. Survivor’s guilt can be one of those negative cognition patterns that is associated with PTSD. Is there a proven correlation between PTSD and increased suicide rates? I do know that we do see increased rates of depression when somebody is a survivor of a violent event like this, and certainly suicidal ideation is a risk factor associated with depression. However at this point there is not to my knowledge any hard data that shows that there’s an increased risk of suicide after an incident of mass violence or a school shooting. The events of this week are, I think, giving us some new new information to consider because we wouldn’t typically talk about suicide as a common reaction or a common outcome. That’s interesting. And in terms of you know suffering from PTSD, is that the kind of thing where every student in the school would likely have it or just a small portion? And are there any predictors of who is likely to be the most affected? You can expect that everyone who is in the school might have some post-traumatic stress symptoms. But the majority of those will not develop a diagnosable disorder of PTSD. Having the symptoms doesn’t equal the disorder. People who are more at risk are those who had a bigger dose of the event, so they were close in proximity in duration and intensity. Another indicator is around recovery resources. We know that one of the biggest protective factors is having a sense of social and interpersonal connectedness and that could be their parents or a faith community, or other survivors or a therapist. We also know that the way that kids adjust is predicted by the way that their parents adjust. One important message that I want people to hear is the importance of parents taking care of themselves, because kids are very aware of changes in their in their support system. How are school shootings different than other mass traumas in the way the community responds? The fact that they are intentional — that a human caused it — means people are typically more at risk for a negative reaction than in natural disasters. Not to minimize in any way the trauma that can be associated with a natural disaster. But there’s something about the intentionality and the lack of humanity around school shootings that makes them potentially more harmful to survivors. There’s also issues around being involved in the criminal-justice system that’s just an additional layer of distress on top of the losses themselves. One of the things that almost by definition trauma does is it changes one’s worldview — it sort of disrupts one’s view of the world as being a safe place, It’s almost a total loss of control in one’s ability to take care of one’s self. If school is a place where you went and you felt safe and secure and you trusted the people around you, having the act of violence take place in that setting really can be disruptive to your entire view of the world. Kids all over the country are having their sense of school as a safe place challenged, to some extent. What about the whole media aspect? Particularly from people on social media like Alex Jones spreading lies and conspiracy theories about the Newtown shooting being staged or about Parkland students being crisis actors. One important aspect of healing is having your experience be validated and feeling like people are responding to your needs. Conspiracy theories are an invalidation of people’s experiences. It’s like being revictimized and re-traumatized every time their experiences are invalidated. That certainly is another layer of distress and trauma. When it comes to media attention in general, we have debates about this in my office as to whether the role of the media can be positive or negative. At some level, when the media shows up it shows that the world cares and is paying attention. But then when the media leaves there can be a void. The attention of the world has moved on to other things and people are still left with their lives devastated. The other thing I’m worried about with the media is with Parkland, some of the kids were portrayed in the media as being so strong; they’re out there fighting and they’re activists. But then there are other people who aren’t in that place, and they don’t feel strong and they don’t feel like marching. And I think those kids may really struggle with feeling like it’s not okay to feel the way that they’re feeling. Do teenagers process survivor’s guilt differently than adults do? Their prefrontal cortexes — the part of their brain that does decision-making and planning and rational thinking, and which understands the long-term implications of their actions — is in active development during adolescence. So they process information differently. So if they develop negative distorted thinking around something like survivor’s guilt, it can get rehearsed and reinforced over and over because their brains are still developing. It can process in the brain in a way that sticks. But another message I really want everyone to hear is that there are several empirically validated treatments that are very effective in treating PTSD, including trauma-focused cognitive behavioral therapy. This situation is not hopeless — there is help available. We have to normalize that it’s okay to to go get help and that you don’t have to suffer in silence or pretend like you’re feeling strong if you’re not feeling strong. What Happens to Mental Health of School-Shooting Survivors?